Replacing skis is an annual event if you ski a hundred days or more a year but for the rest of us the right pair of skis can last for years. As you demo different skis, it is important to decide what type of terrain you usually ski and what style skier you are. If you are a powder hound chasing the snow all season you may only need one pair of fat skis, but if you spend time carving groomers and playing in the bumps, you may need an all-mountain ski as well. Many professional skiers have designed skis for their sponsors based on everyone’s favorite condition, powder. The designs vary from Seth Morrison and K2’s Seth Pistol: fat, heavy and aggressive, to Shane McConkey and K2’s Pontoon: inspired by surfboard designs the tip and tail bow up for flotation. Now almost every ski manufacturer makes a fat powder ski. These large surface area models float through powder with ease, but can be hard to maneuver in tight places and very difficult to edge on groomers or in crud. All mountain skis are just that. Designs vary as skiers do; some are stiffer with more sidecut for greater carve-ability, others have narrower tails than tips for better bump maneuverability. Sidecut and length affect turn radius, so when you find a ski you like, try different lengths to fine-tune your choice. Generally, old-school skiers who keep their feet together won’t like a ski with a lot of side cut, and racers won’t like a straighter ski. More aggressive skiers will want to look at stiffer skis for more power and stability at higher speeds. Less aggressive skiers do not need as stiff a ski, and may even find them harder to turn, particularly if the ski is heavy. Jibbing skis make landing and taking off switch a breeze. Much like all-mountain skis, twin tips come in various sidecuts, stiffnesses and lengths. Also important is the torsional rigidity, or twisting stiffness, and swing weight, a ski's resistance to swinging in a circle. Grip the ski in your hand where the binding would be. Pivot the ski back and forth. Lighter skis pivot faster, meaning the ski will be lighter underfoot and easier to ride switch. Less torsional rigidity helps maintain the ski’s contact with the snow, also making riding switch easier. Park and pipe skis tend to be softer to help cushion landings. All-mountain twin tips are wider, heavier and more rigid making them perform well carving, in the park and pipe and in powder. Big-mountain twin tips are fat, heavy and thick for floating in powder and hitting huge kickers and landing switch. A good twin tip will be a little stiffer in the tail to enhance popping on takeoffs and stability in landings. Softer tips turn easier and float in powder, but flop around at higher speeds, stiffness anywhere in the ski aids in stability. Historically women specific skis were a dumbed down version of a men’s best selling all-mountain ski. To make them lighter, manufacturers took out core elements often making them too soft and destroying their performance. 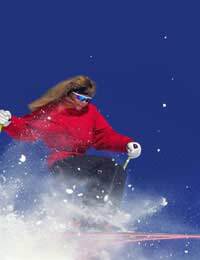 In 2002, K2 created a T-nine alliance to create a line of skis designed specifically for women. The five models were named after Title IX, legislation included in the Education Amendments in 1972 that requires schools that receive federal funds to provide girls and women with equal opportunity to compete in sports. Five years later the line includes three women’s telemark designs, and seven alpine designs including powder, carving, and all mountain skis of various sidecut and stiffness. K2 also offers women specific twin tips. Many other ski manufacturers are playing catch-up offering one to four styles. Women buying skis need to look at the same factors as men: sidecut, length and flex in proportion to preferred terrain, aggressiveness, turn size. Skis can wear out, blow an edge or break. Test your ski’s reflex by planting the tail on the floor and holding the tip. Flex at the binding. If the ski pops back quickly you’re still good, but if the ski is slow or bent it’s time to hit the demo racks. While there, pick up a ski lock to protect yourself from ski thieves. Testing multiple skis on your favorite runs is the best way to choose new boards. Ask a reputable salesperson questions about various brands and be honest about your ability and style. Aggressive skiers prone to breaking skis should do extra research; how durable is the ski and what is the manufacturer’s repair/replacement policy? New skis whether just for the graphics, to keep up with the Morrison’s, or because it’s time, makes the sport easier and even more enjoyable.